In recognition we are sharing information on how you can support loved ones and friends with prostate cancer, a disease that affects one in six men in the United States. 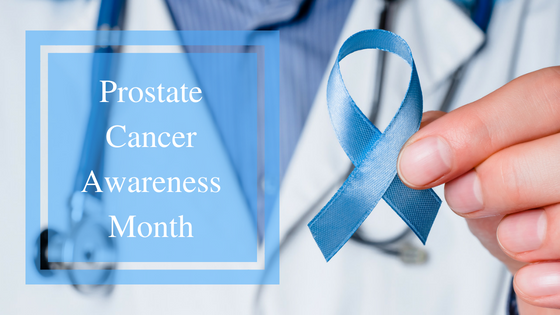 Prostate cancer is one of the most common cancers found in men, which is why it is important to educate the public and raise awareness of the risk. African-American men are at a higher risk of not only developing prostate cancer, but also harboring higher-grade more aggressive diseases when compared to the general population. In most cases, there are none. This is why the Prostate Specific Antigen (PSA) blood-test, along with a prostate examination, or DRE, is important to screen for prostate cancer, because in many cases, prostate cancer is asymptomatic, especially in the early stages. There is no set age for when a man should begin prostate cancer screening. However, the National Comprehensive Cancer Network (NCCN) guidelines recommend discussing the risks and benefits of screening for men between the age of 45 and 75. Step 1: The first step in the screening process for prostate cancer is a prostate exam, where the doctor will perform a careful rectal exam to feel for any prostate abnormalities. Step 2: The next step is to conduct a PSA test. PSA is a protein produced by the prostate that can be elevated in men with prostate cancer. It is used to screen men who are not experiencing any symptoms of the cancer. Next Steps: If the PSA test comes back above the recommended level, a prostate biopsy may be necessary. Depending on the results of the biopsy, the doctor will discuss treatment options with the patient. You can show your support for your friends and loved ones in multiple ways. It truly is the thought that counts. Contribute to the Prostate Cancer Foundation to help fund research to discover better treatment options and to find a cure! Spread the word to friends and family, prostate cancer is very treatable when caught early. Wear a blue ribbon as a symbol of support. Participate in local events to help raise awareness. Get screened for prostate cancer as a precaution! If you would like to learn more about prostate cancer or suspect that you are experiencing any related symptoms, please make an appointment with one of our locations. We will be happy to speak with you!